Let me start this review off by saying I’m gonna do my best not to be biased reviewing IBC Root Beer. Much like IBC Black Cherry (which I was going to link there until I realized I’ve never reviewed it) I have an emotional tie to IBC Root Beer. Every time I go to visit my grandmother, about a 3 hour trip, for the ride home she always packs me an IBC Root Beer. When I say pack I don’t mean she puts it in a bag and hands it to me, oh no; she wraps it in a paper towel for the initial layer, then wraps the bottle in foil to preserve its frosty feel, finally she places it in a plastic grocery bag and wraps that around the bottle several times until the bag is almost like a form fitting garment. I can only imagine that this last step is for cushioning, but it doesn’t matter because it’s created a great memory for me over the last several years. To add onto this fond memory of IBC Root Beer I have to go back even further into my life back when I was about ten years old. My mom used to drink Diet Sprite all the time, not like an addict or anything but enough that we were fully stocked most any day. Since Diet Sprite isn’t exactly a “treat” for your average 10 year old she started purchasing IBC Root Beer for us as well. I’d never seen anything like it, the bottle was so cool. I’d never had a drink out of a glass bottle before, it was so mature, almost like a beer… but I was allowed to drink it. I guess you could say that IBC Root Beer was my first jaunt into the world of non-mainstream sodas. Fast forward 20 years and you have me sitting here today still excited to drink one for all the above reasons. It’s like every bottle of IBC Root Beer is a fond memory for me, and I felt I had to tell you all that in case you saw some sort of bias. I’m going to do my best though. On with the review! IBC Root Beer is a root beer made with HFCS which already sets it back in the “Root Beer Game”. Upon writing that sentence I immediately want to play the “Root Beer Game” whatever that may be. To follow a negative with a positive we have the bottle design. I’ve always enjoyed that IBC didn’t have any kind of paper label. The logo is actually part of the brown glass bottle, as are all of the states you can return this bottle to for a refund. This creates a unique look in a market that’s inundated with paper labels trying their best to look old fashioned. It’s time for me to twist off that fancy red bottle cap that I’ve removed hundreds of times before. I always enjoy the vapor that a bottle sometimes releases when you first open it. Something about it adds to the chill factor of the beverage at hand. Fortunately IBC Root Beer has this visible vapor and the smell that follows is most certainly that of a root beer. IBC Root Beer doesn’t have a creamy scent like you might find with an A&W. I’d say that licorice is the strongest scent I perceive with each whiff of the bottle. If the smell of licorice is off putting to you then let me try this comparison instead. If you’ve ever eaten a root beer flavored Dum Dum sucker then you’re already familiar with the aroma I’m experiencing here. On to the drinking! The root beer flavor of IBC is weaker than others which is surprising for me to find out since I usually drink this with such nostalgia. Don’t get me wrong it’s not weak to the point of watery but I’ve had stronger root beers. I will say that with each sip the flavor builds upon itself creating more and more of a root beer experience as you drink it. Some of that can be contributed to the HFCS they use to sweeten it since the syrupy feel never completely leaves your mouth. The carbonation level of IBC Root Beer is comparable to the slightest of buzzes on your tongue. The HFCS starts to work against it about midway through the experience as it begins to make the fact that this isn’t an all-natural root beer more well-known with each sip. As you reach the bottom of the bottle the carbonation kicks up a bit more as it now has further to travel with each upending. This adds a delightful mouth feel, but the flavor isn’t improved. For some reason the burps afterward have a better flavor than the root beer itself… no idea why. 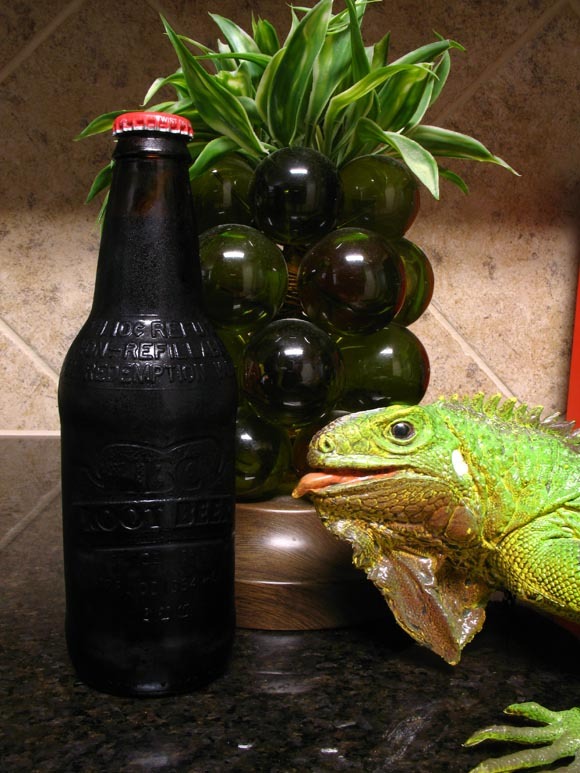 Overall IBC Root Beer is an average root beer in a wonderful bottle. I hope I’ve done my job in keeping my bias out of this review. I’m going to stop now before I change my rating.